Moldova-based striker Blessing Olabiran has targeted more goals after netting on his competitive debut for FC Saxan Gagauz Yeri in their 3-0 win over Zimbru on game week 21. The number thirteen scored his team’s third goal in the 72nd minute, and was delighted after the game at Stadionul Ceadîr Lunga. Speaking to his club’s official website, Olabiran said : “I feel fine and confident. I hope that I will continue to score as many goals as possible in the rest of the season. 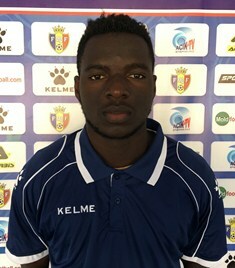 Olabiran, who has been nicknamed Benito by his teammates, is not the only Nigerian player on the payroll of FC Saxan, with ex-Nigeria U17 and U20 international Aliyu Mohammed returning to the club in the winter transfer market.